It is hard to say goodbye to an old site but it had to go. I originally built this site myself in 2004 using Frontpage 2000. At the time it was state of the art and looked great. Besides updating with new products I did not make any major changes to it. As rapidly as technology advances a site should see a major update every five years. We have been working for three months on the new site and it is now ready. One of the main reasons we did an update is to improve our rankings in Google. A site that is updated regularly, is mobile friendly, & has a good blog will help us get back to the top of Google search again. 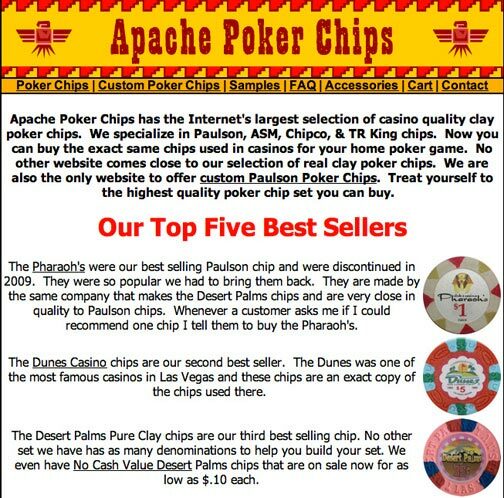 Apache Poker Chips is the internets best source for high end poker chips and our new site will help us reach out to more customers around the world. While ican understand missing the nostalgia and familiarity with the original site, the times and technology demanded an upgrade. The site has a few obvious tweaks necessary still, but overall this is a highly anticipated and welcomed change. Looking forward to continued chipping fun! Really miss the old site! Simple, effective, familiar! My spouse andd I stumbled over hre from a different web address and thought I miught check things out. to exploring your webb page repeatedly.